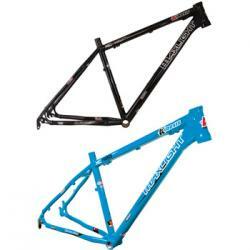 This frame is designed specifically to match the longer travel, lightweight, adjustable 100 - 130mm travel suspension forks and is based on the geometry of the Maxlight XC for precise, quick steering, singletrack and all mountain hammering. It is made from Hydroformed Kinesium and has a 3D forged down tube gusset, seat tube with forward facing slot and top tube with cable stops and hose clips neatly tucked out of the way underneath. It also has a comfortable hourglass 'Kinesis Superlight' seat, chainstays with neat hose clips, 3D forged dropouts and ZeroStack head tube. It comes as a 42cm frame which weighs 1520g.